Patients will regularly ask us if they are candidates for laser spine surgery, with the impression that a procedure involving "laser surgery" uses the most up to date technology available. In reality, however, minimally invasive spinal microsurgery (utilizing an advanced, high technology operating microscope and retractors or tubes which limit soft tissue trauma during surgical exposure) now represents the highest tech spinal surgery available. 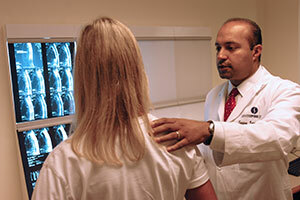 Laser Spine Surgery has many limitations. The anatomy and the surgical procedure are observed through an endoscope which provides only two dimensional visualization - there is no depth perception. The limited depth perception is not a major impediment when an endoscope is used in a joint such as the knee for an arthroscopy, nor the abdomen such as for laparoscopy. In the spine, however, it is not desirable to abut the scope against sensitive and easily damaged structures such as the nerves or spinal cord for lack of 3-D depth perception. The lack of depth perception also provides a challenge when targeting the laser used in laser spine surgery. Burning a hole in the dura, resulting in a difficult to repair spinal fluid leakage and severe spinal headaches can be the result. In addition, laser surgery works best against soft tissues but is a poor instrument for removing the bone spurs that are often a significant component in an older patient's nerve compression in spinal stenosis. In contrast, minimally invasive spinal microsurgery offers true three dimensional visualization with better illumination than the laser surgery endoscope. Micro-burrs and bone rongeurs allow direct trimming of bone spurs to relieve pressure on nerves. High tech operating microscopes also provide a variable field of focus to permit more detailed observation of pathology and any ongoing corrective surgical procedures than the fixed focus laser endoscope. The dual eyepieces on the operating microscope allow both the surgeon and the assistant a direct view of the surgical field. This allows any necessary retraction of nerves by the assistant to be done in a safe manner under direct visualization. The variable and deep field of focus of a high tech operating microscope has also allowed development of advanced surgical procedures such as the laminotomy and laminaplasty technique for decompressing nerves on both sides of the spine in lumbar spinal stenosis. In this procedure, only a unilateral surgical approach is necessary, so there is only limited trauma to the soft tissues on only one side of the spine while still allowing nerves on both the right and left sides of the spinal canal to be decompressed . The surgeons at Denver Spine Surgeons have been at the forefront of developing the technology and techniques in advanced spinal microsurgery. 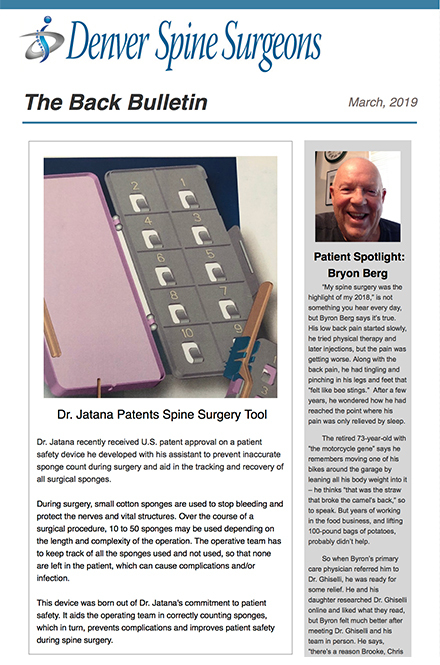 Our deceased partner Dr. John McCulloch invented the minimally invasive soft tissue retractor and microsurgical instrument systems which bear his name. Dr. McCulloch also co-authored what is considered to be the definitive textbook on spinal microsurgery - Essentials of Spinal Microsurgery (Lippincott-Raven Publishers). Denver Spine Surgeons have been Course Directors and faculty for continuing medical education courses on minimally invasive spine surgery sponsored nationally by the North American Spine Society (NASS) and the American Academy of Orthopaedic Surgeons (AAOS). Additionally, our surgeons have authored chapters on minimally invasive spine surgery in major textbooks including Rothman and Simeone's Spine (Elsevier publishers), The Adult and Paediatric Spine (Lippincott, Williams and Wilkins publishers) and Spine Surgery-Tricks of the Trade (Thieme publishers). Thus, given a choice between 2-D laser spinal surgery vs. 3-D minimally invasive microsurgery, the surgeons of Denver Spine feel that microsurgical techniques offer a clear high tech advantage over laser surgery. Microsurgery as well as minimally invasive techniques for other spine procedures such as fusion are a focal point of the surgical philosophy at Denver Spine.